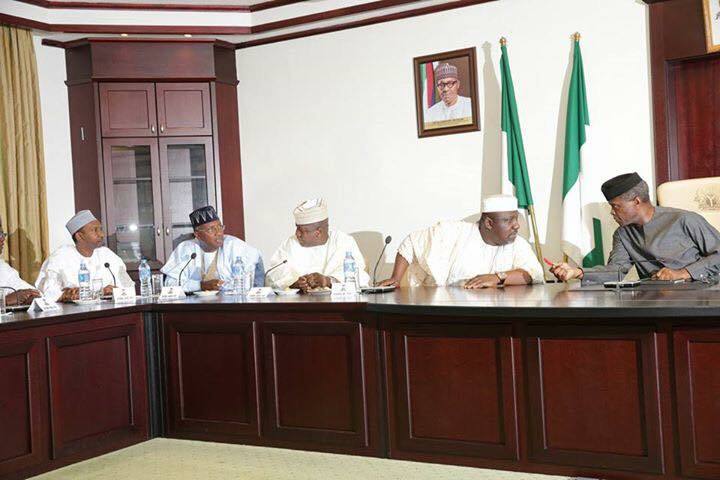 Photo News: Acting President, Yemi Osinbajo, meets APC governors in Abuja – Royal Times of Nigeria. Acting President, Yemi Osinbajo, on Thursday had a closed door meeting with APC governors at the state house in Abuja. According to the chairman of the APC Governors Forum, Rochas Okorocha who spoke with state house correspondents, the meeting was centered on issues bothering on their party, APC. He said: “We came to discuss issues relating to our party and our government and how to move our party forward. We discussed a lot of issues on how to move the party forward, how to strengthen the party and how to make sure our party remains victorious in all elections. Very soon, we will have convention. That is part of the things we are discussing”.